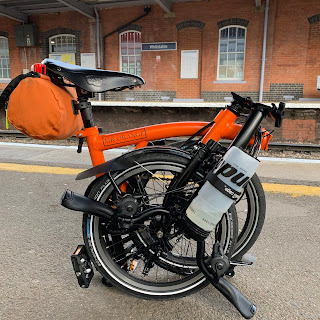 My Orange Brompton: Starving to death for the Brompton World Championships! Starving to death for the Brompton World Championships! My training for the Brompton World Championships has taken on a very serious turn believe me. My healthy eating regime has consisted of me having porridge for breakfast, a healthy luncheon and a healthy dinner. No in betweens have passed my lips. I even turned down a chocolate digestive biscuit this very a.m. I have drunk lots of water to ensure I am hydrated and replaced my desire for chocolate with an apple or similar. I think I am going through the first stages of cold turkey. Every advert I watch on television, listen to on radio or see in magazines, seems to have items I would like to consume but dare not to. This is only after one day. What I am going to be like by the end of the week is anybody's guess. As I sit typing this blog entry my stomach making a noise that is trying to communicate it is hungry and needs feeding. In short I am starving! Do athletes have to put up with this? My calorie intake today would have filled the Wartime Government of the 1940's with glee as I have rationed myself with enthusiasm. I know that on the top shelf of the fridge downstairs in the holiday cottage I am now staying at, sits an unopened family sized bar of 'Cadburys Dairy Milk.' I have just watched the last episode of, 'The Walking Dead' on Channel 5 and wonder in my lust for fresh chocolate whether it will survive the night! No. I must be strong. This is good for the Brompton World Championships and it will be good for me in the long run. Any words of wisdom, encouragement or otherwise would be gratefully received.